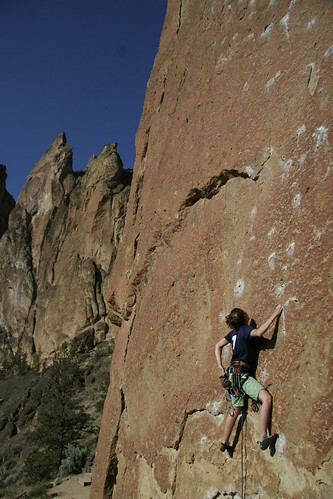 It has been about a month since I got back from Smith Rock and thoughts beyond disappointment have started to flow. For all intensive purposes I had performed poorly on the trip despite having fun. I only managed to send one hard climb on my tick list and I neither felt strong nor was I able to maintain a good mental space in smith. However Smith did accomplish a big goal of getting me in shape for my successful ascent of Positive Vibrations. I have been writing up a climbing bio which made think about my strengths and weaknesses. In my first many years at Smith ( I went each May from 2002 -> 2004), I saw good bits of progress and was able to really push myself. This was not true in June, as I only finished off a climb I had gotten close to years prior. While I was able to do harder routes than I have on previous trips to Smith I did not find my self at the proverbial “next level”. My main realization was that I really like pulling down on holds. I am not so good when the sequence is unclear or I am required to apply substantial force to footholds. While climbing granite I have gotten used to keeping weight on my feet but this did not translate so well to Smith Rock tuff. 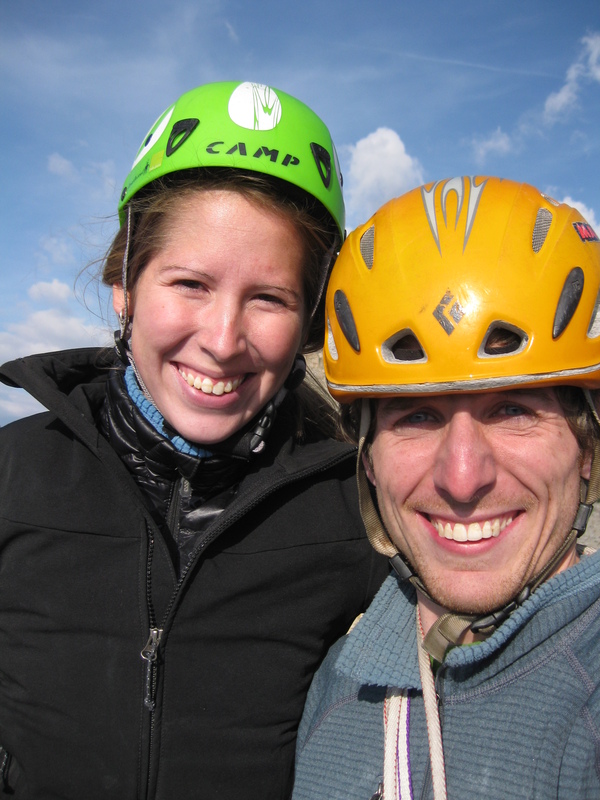 Lizzy, well versed in small footholds, had a very good trip and sent her hardest route yet. When I top roped Sunshine Dihedral it was crazy to learn how little pulling was necessary despite the high grade. Most of the time the moves were one hand barely making a lock or crimping the crack and the other hand palming against the wall to help move one of my feet up. The climb varied in steepness and some of the smears were pretty desperate. I was very happy not to fall since I expected my feet to give out at any moment. 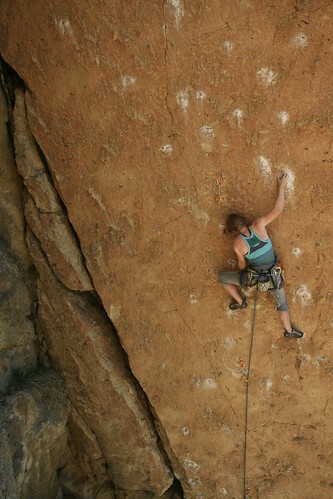 Big props to Lizzy for the lead and for believing in such footwork intensive climbing. Standing above the void unable to go any further. Since January, when I tore a finger tendon, my fitness has been slowly decreasing but I have managed to send many “difficult” routes by trying really hard. I have learned that mental determination can help me overcome both physical and mental issues on a climb. Putting in closer to 100% or even 110% will make the physical part of the climb possible. When I really want to send I can push through my fear and keep climbing. However when this mental drive was absent I could not rely on my strength to get me to the top of a climb. 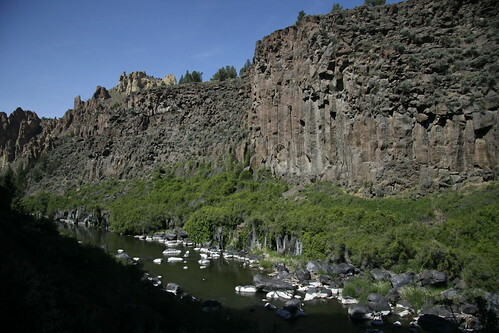 The beautiful columns of the lower gorge. In Smith I had a great first day and it was likely the best climbing day of the trip. I sent one of my projects, onsighted a climb on my ticklist but in all my enthusiasm tired myself out. Thinking back, I should have been pacing my self more and getting used to the climbing instead of throwing myself at the routes. Day two I had to take it easy since I had tweaked my right shoulder on a powerful gaston the day before. The sun was quite hot and really made me struggle to find climbs to do. It was hard for me not to be able to chose a project to work on for the rest of the day due to the changing shade. I attempted a few 5.12’s – Latin Lover and Take a Powder – with little success and only got to the top with much trickery via stick clip. I was not doing well with the hold size and could not easily commit to the spaced bolts. Lizzy Starts up Pure Palm. The morning of the 3rd day I was quite happy I was in need of rest and went on a nice run to the monkey’s face while the girls slept in. My finger skin was suffering and Lizzy was excited to do some jamming so we headed to the lower gorge that afternoon. The weather was much cooler than the previous day and we enjoyed climbing in the shade. 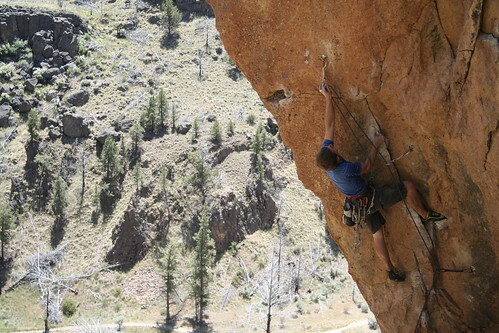 After a warm-up my first lead was Pure Palm which I had finished a few years prior with a few hangs. I started up the holdless stem box and made good progress to the 3rd bolt. After much experimenting I took and tried to figure out the mental and physical crux section. Lizzy making her way up Pure Palm. The main idea was to stem up with your feet above the last bolt and some how make it to the next couple of “holds”. I took a few falls, which helped my lead head, before backing off since I didn’t know what to do. Lizzy went next, made it up a bit higher but then fell off and lowered. Maddy was next and figured out some crazy hand foot match beta which I tried to memorize and she almost made it all the way to the top (which would have been a flash) but whipped on one of the final bolts. I tried again and was able to figure out slightly different beta and made it all the way to the top. 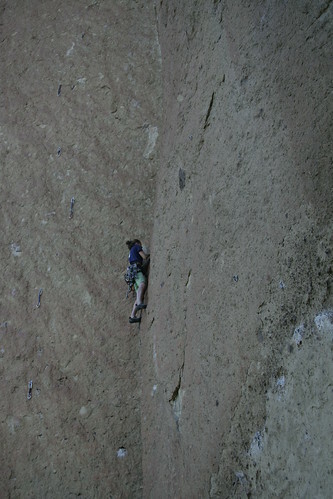 This route was not at all my style but after seeing a solution I was able to commit to the scary crux. Later in the day I onsighed an amazing finger crack called Last Chance that was quite pumpy but super fun. The last route of the day was On The Road which Lizzy styled on lead and I top roped as the light faded. The rest of the trip I never seemed to regain my usual power, but was happy to onsight a number of 5.11’s, including the super exposed first pitch of Monkey Space. My lead head never quite came together either and I was unable to put 100% into the climbs I tried, falling off the onsight of P2 of Monkey Space and hang dogging all over the first pitch of Astro Monkey. With three people we had to split up our time and make sure everyone got to work on their projects. Since I was not highly motivated I tried to support Lizzy and Maddy on their routes. Over the trip Lizzy strategically worked through a few Smith 5.11’s before jumping on her onsight Project, Sunshine Dihedral. Lizzy spent the whole “send” day resting and preparing for her lead. The many days before she had tuned her stemming and gear placements on many easier routes. I believe taking this approach to a project is key since training really works and getting used to the rock and specific body positions pays off. Despite not having climbed harder than 11b on gear and 11c on bolts Lizzy onsighted Sunshine Dihedral 11d! for her hardest route to date! As I said above the climb was stout and I was very happy to climb it on TR. 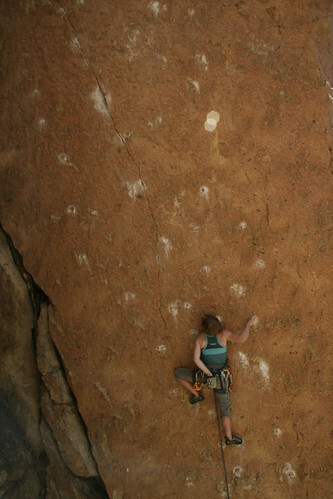 Her performance was one of the best of the trip and shows how important desire and commitment are to sending hard routes! One thing I was really excited about from Smith was how well the following photos turned out. I took the time to stick clip my way up a neighboring route and managed to get a nice angle while Maddy was climbing Latin Lover. The wall was still in the shade and the orange hue of the rock really jumped out. I am learning ever so slowly how to take better pictures and I think these are pretty cool. If you haven’t read Lizzy’s day by day breakdown of our trip be sure to take a look. Look in the comments of Lizzy’s send list for some of my suggested routes. Screaming Yellow Zonkers, 5.10b (F) – a classic! love the knobs! Badfinger, 5.10b (R) – fun! Cornercopia, 5.10b (R) – the last 4 are all on the Wildfire Wall – what a mecca for 5.10 and 5.11 trad climbs! 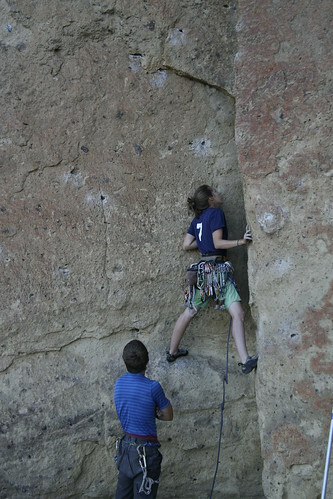 A Woman in the Meadow, 5.11a (F) – pumpy! Still many projects to get back on, but consider this a list of recommended routes at Smith (except maybe for Wedding Day, which wasn’t that awesome). Hang tight for some blogs from Luke (right now I have the advantage since I’m DONE WITH SCHOOL WOOO). It takes a lot to be successful and in the past many months, as well as the last 4 years, Lizzy has been working hard at Caltech on her Bachelors degree in Geology. She graduated one week ago and is currently celebrating in Smith Rock! It was a bit cloudy for graduation and it even rained a little bit, way out of character for SoCal. Lizzy and I had fun showing her parents around Pasadena between various graduation activities. Lizzy with friends Deepak on the left and Gabe on the right. Lizzy lost in a Sea of graduates. Lizzy with her Hawaiian lei. 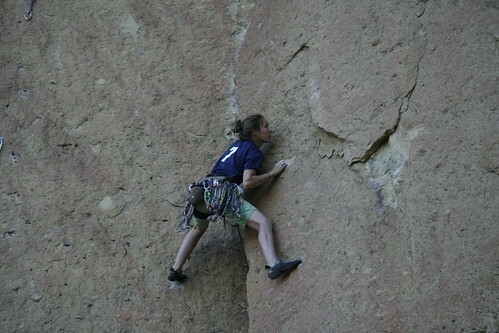 After bringing Lizzy and her parents to the Airport on Saturday I snuck away to Idyllwild to get in a bit of climbing. Saturday night was a bit surreal as much of Idywilld seemed to be stuck in the clouds. Konstantin drove up from San Diego and we camped at San Jacinto State Park which is quite pricey but convenient to the climbing. The idea for the day was to do Vahalla as a warmup for the Edge. The Edge is supposed to be super scary and if I could style Vahalla it would most likely not be a problem. Way back in 2005 Hartley and I had tried to climb Vahalla hot off reading stories of the Stone Masters byJohn Long. Hartley brilliantly lead the first pitch which I some how followed and I’m sure both of us fell at least a few times. 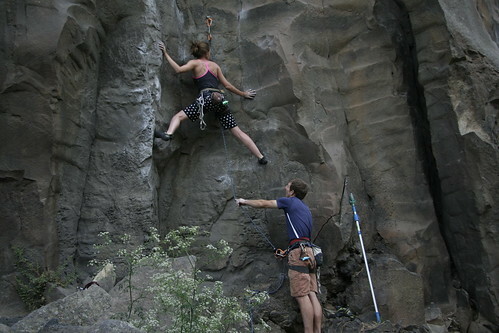 The 2nd pitch contains the business and neither of us could commit to the insecure smears on lead while above the bolt. We bailed and went to work on Insomnia another climb that was well above our head at the time. Now in 2009 I was confident, perhaps too much so, that I could climb Vahalla and so I started up the first pitch. The granite is wild with knobs and scoops and I slowly nervously made my way up to the 1st bolt (there are only 3 for the pitch). Following Konstantin’s advice I got up a little higher with some tricky stemming and clipped the 2nd bolt and prepared for the crux. I must have spent at least 10 minutes trying to find a way around the next few moves but nothing worked. After too much consideration I transitioned my weight to my right foot while deadpointing for the next crimp. The crux was not quite over and I magically held on to nothing as I slowly worked right evidently doing a good job of keeping my weight on my feet. At one point I thought for sure I would fall but I tried hard, as hard as I possibly could, and made the final bump right to a better crimp end eventually the jug. I was relieved as I manteled the next ledge and clipped the final bolt. After a bit of shaking out and advice from Konstantin that I was through the crux and should avoid falling, I made the final few traversing moves and manteled again to log ledge. My confidence was a bit shaken but I still had a lot of climbing to go. After following the pitch I lowered Konstantin to an old bolt and tied him off to the anchor as a backup. At the lower position there would be more rope out and it would follow a straighter line reducing rope drag. I made the traverse right to the bolt and stared at the crux. This time I would not have beta and would hopefully be able to figure out the moves. Shakily I moved up on the poor holds before getting stuck not knowing where to go. Using both hands in opposition just to stay on, I couldn’t make progress. I tried to shift my weight around but lost my balance and fell. I was barely above the bolt and Konstantin gave me a nice catch which helped put my fear of falling at rest. I lowered back to the hands free stance below the bolt for my next attempt. 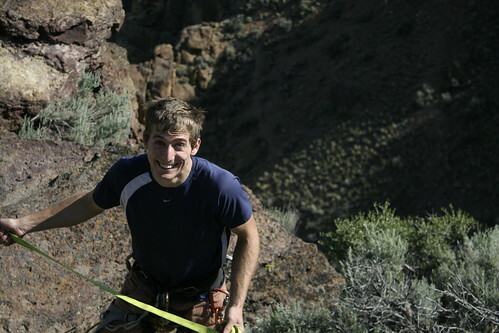 It seemed silly and unnecessary to un-clip from the bolt and traverse to and from the belay. Konstantin gave me some beta about going right to a rectangular hold and then up. I saw the hold he spoke of and figured out a better sequence. As I went back up the smears some how felt more secure and I got established with my left on a slopey hold and my right on the poor rectangle. I kept my weight in and reached up left for another sloping crimp. It was crazy that these holds were keeping me on the wall as I reached up and grabbed an incut divot for my right hand, bringing my feet above the bolt. I thought I had made it and shook out on the good crimp. Not wanting to blow it and take a big fall I felt around and eventually manteled up with my foot on the good hold. Two moves later I was at the bolt and was ready to enjoy the rest of the 5.10 climbing to the anchors far above. I wandered through the golden granite with a big grin on my face amazed that a climb could make its way up this blank undulating face. I didn’t quite sling everything properly and reached the anchors with a bit of rope drag. For the final pitch I went up and left missing a bolt which I had to down climb and clip after I had given up hope and tied off a big knob. After the Sundance anchors I kept climbing into the SunDike variation which I felt was quite insecure and difficult especially for “5.10a”. I think my mental ability was sapped and I was ready to be done. We rapped off and I was happy both for sending Vahalla and for taking real fall which is hard for me to do. It seemed that I was not yet ready for The Edge so we made our way to Disco Jesus so Konstantin could have some fun on the sharp end. All of the above photos are of Konstantin leading the 2nd pitch of Disco Jesus. 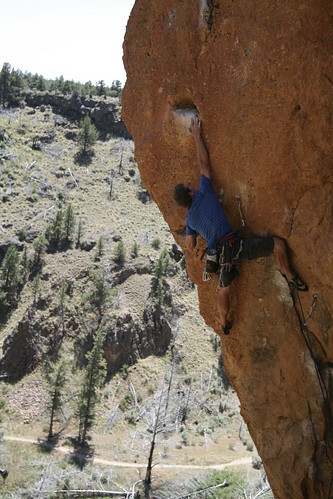 The 2nd pitch features insecure dime edging followed by a crazy smearing sequence on underclings finished off with a hand foot match mantel to a jug rail that leads to the anchors. Photos thanks to Darshan who’s name I recognized from MountainProject.com and happened to be climbing in the area. After finishing the three pitch Disco Jesus we ate lunch and I got back on the sharp end for Miscalculation. Konstatin had tried it previously but bailed at the first crux. As usual I took my time sewing up the crack and slowly making progress with thin locks and insecure laybacking. I got through the first crux and prepared for most difficult part protected by two #5 stoppers before getting in a small finger sized cam. The locks were thin and I suppose that it may have been easier to lay back than to jam it straight in. At the top I remebered to stem and after a bit more climbing I made it to the anchors for the onsigh of the full value 90 foot pitch. I had placed all of my small nuts and cams and was left with way too many big pieces on my harness.. Oops! Even though it was only only 3pm we had climbed 7 hard pitches and were ready to relax. Back at the car we ate a second lunch with a bit of wine from the night before. I was hoping to see a few friends at Tahquitz and while we didn’t see who we expected we ran in to Leah who needed a ride home. It was a great weekend and really good for me to work on my slab climbing weakness. This week has been quite busy as Lizzy made her way from Seattle to Smith Rock and I finished up as much work as possible. 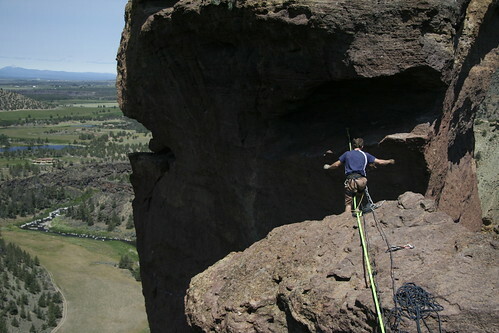 Tomorrow I will fly up to Portland to relax and enjoy many of the classic routes at smith. The Road to June and our Contest Winner!! It is June already and Lizzy will graduate in a week and then 8 days later I will fly up to Portland, Oregon for a week at Smith Rocks. It has been exceptionally busy at work and we have been making the most of our weekends leaving little time to write stories and post photos. Climbing as been going well and I am finally starting to get back the the same levels from six months ago. My various finger injuries have been more bothersome than expected but I have been enjoying “moderate” routes at gym and have been mixing up my workout routine . Lizzy trying to catch up on sleep after our post midnight arrival. First off we held a little contest for a SuperTopo shirt and despite our efforts its been over two weeks without posting a winner. Via a random number generator we have a result and I will be sending John M from North Dakota the Shirt!! Congratulations to John and thanks to everyone who left a comment. Hopefully in the future we can give away something desirable to a large audience and perhaps get more then seven responses. All dressed up for Phantom. As Lizzy already posted on Twitter, back in May, we spent our Anniversary in Las Vegas. We dressed up and went to a show between two days of sport climbing. Phantom was awesome and it was quite impressive to see how many people go to casinos. The show was a ton of fun and it was great to see all of the classic songs performed. Previously Lizzy and I had been through some of the cheaper, dirtier casinos that made me wonder why people gamble. This trip our show was at the Venetian and they had some crazy sights. The photo below was taken inside; needless to say I was impressed. We were able to climb before the show on Saturday and all day Sunday. The limestone at Robbers Roost did not disappoint and Lizzy and I checked out a few routes we had yet to try. 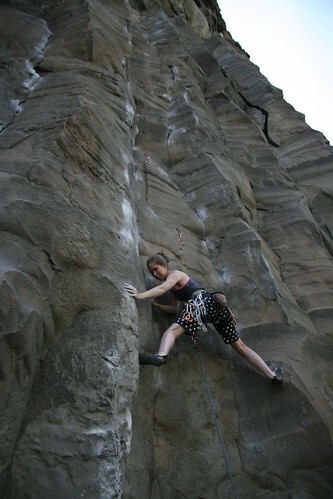 The climbing varies greatly depending on the angle of the rock and it occasionally seems like you are climbing at different areas. We started on some slab routes with small sharp holds and features caused by drips. After a super fun 5.8 warmup Lizzy and I both lead this exciting 10+. 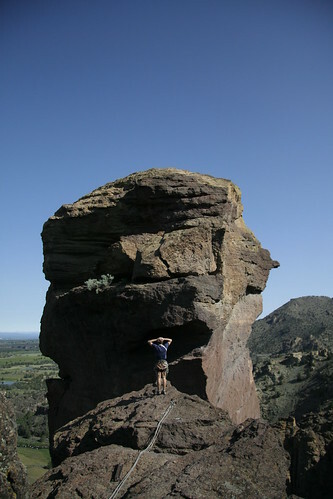 It was likely bolted on lead and often the climber was doing a cruxy move with a bolt well below their feet. I also tried a hard 5.11 slab which I onsighted until the final bolt. Unfortunately I was quite pumped and did not want to commit to a long fall while pushing into the unknown. I hope to keep a cool head and redpoint the route this weekend. Luke uses a double stick clip to put a draw on the third bolt. After I tried Prince of Thieves, seen above, we moved back to the main area of Robbers Roost. The morning had been quiet and we had not seen very many people. The central section of the crag is in a tall canyon/corridor which really traps sound. We were impressed to see a decent crew of people with the occasional tourist. I had wanted to do the super extension of The Rooster and racked up 20 quickdraws for the 40+ meter pitch. 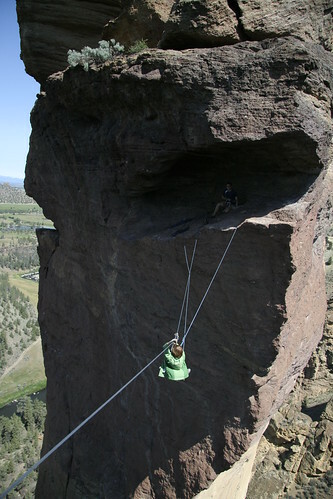 The standard version of the route is 10c with 9 bolts in about 95 feet. It is sharp and a bit scary but a good mental exercise. The 1st extension is 11b and another 3 or 4 bolts. The final extension goes up steeper rock with an additional 5 or so bolts for a total of 17 (which I only figured out after climbing it). It was my first time on the extension and I made it to the 2nd set of anchors onsighting the 11b crux. However I was drained mentally and did not want to commit to the steep upper section and chose to rap off which just barely got me to the ground with our 70m rope. 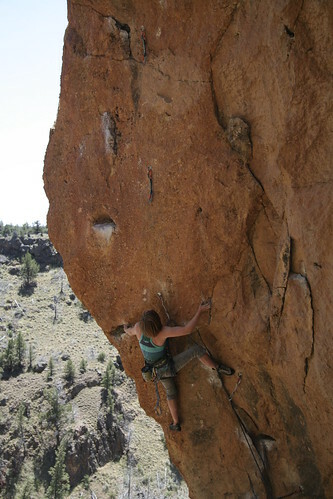 Lizzy enjoys projecting at Robbers Roost and after sending Los Banditos, her 2nd 11c last season, she turned to Five Finger Discount for this years project. 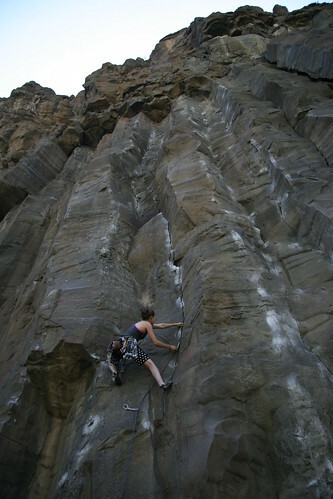 This route is a bit harder and requires more power than endurance to complete its shorter steep crux. I put a set of project draws on the route stick clipping through the crux to save energy. The 4th clip is fairly hard and having the draws on makes the climb more fun. I taped the upper gates closed and hopefully the gear will still be there when we return this weekend. Lizzy skin is losing the battle against the limestone. Lizzy made great progress over the two day weekend and relearned the beta she had developed the summer before. There was no send but hopefully this weekend we will have workable weather and Lizzy can nab another 11c. With the help of some locals I was able to send Highway Man on my third try for my first 12a at Mt Charleston. I also climbed a very fun unknown 11+ route to the right of Five Finger Discount that had a very cool crux involving body tension on slopey holds. 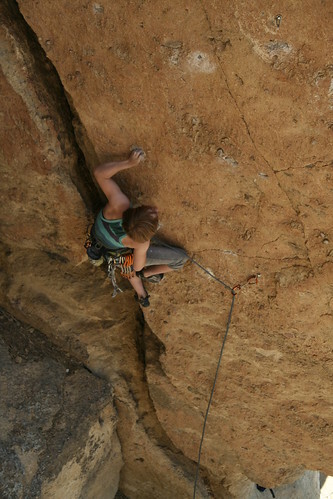 I was happy with my weekend results and to be regaining my sport climbing fitness. As I previously noted we spent Memorial day weekend in Zion and had a blast. I think that my body is now recovered from our day on Sheer Lunacy and am excited for the summer season in the Sierra’s. The short and medium term effects of a very long hard day of climbing are curious and I am still learning how best to prepare and recover. We learned the hard way that it is best to budget for more water than you expect to drink even if it is heavy. This past weekend Lizzy and I had initially planned to go to Idyllwild with some of our friends from Santa Barbara but a last minute cancellation left us with some free time. 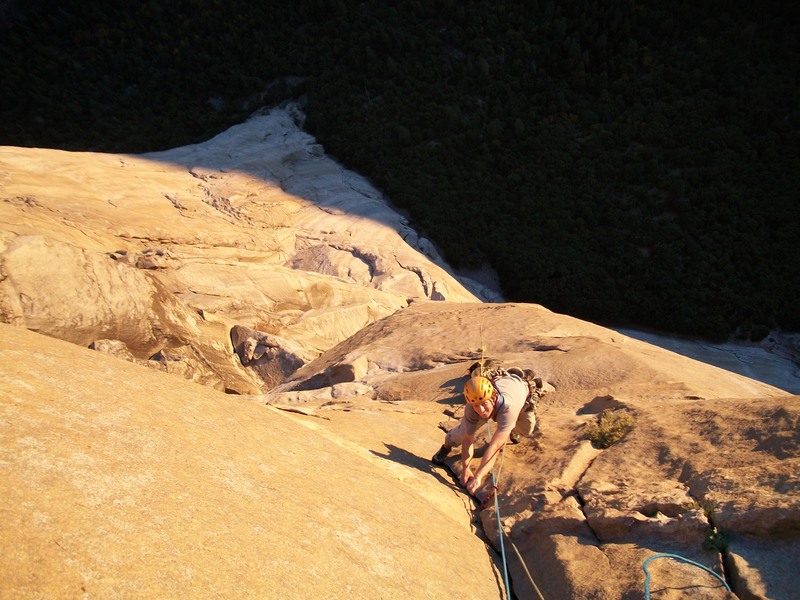 We decided to skip the trad climbing and clip bolts on granite at Keller Peak. Josh and Julie met up with us mid day and showed us some of the different crags. Julie took a few photos and I expect they will be on her blog at some point. We decided to go exploring at lunch and somehow got caught in a impromptu rainstorm. This is pretty strange since Keller Peak is only about an hour or so east of Pasadena but I suppose that once above 7000 feet one can be subject to different weather. Plenty of tourists visit Robbers Roost full of misinformation from this sign. We decided to bail since all the rocks were wet but while driving down the mountain the rain mysteriously stopped. In fact the road was bone dry meaning the the rain had somehow been stuck higher up. After reconsidering options we choose adventure and went to the Dinosaur Wall. This crag does not have a guidebook and we were a bit unsure of the approach. However we could see the rock from the road and made our way their safely despite an encounter with a sleepy rattlesnake. Lizzy cross the road to start the killer 5 minute approach to Robbers Roost. The Lower Dinosaur wall had a few bolted routes and I was feeling good and jumped on the middle line with no idea of the grade. I was able to onsight the route and it was quite fun and easy until the last two moves which allow one to clip the anchors. I swung right and put a TR on a harder route that Josh had attempted in the past. This gave us two TR’s which was nice way to relax after escaping the rain. After a short nap the ladies did the left route while Josh and I worked the right route with a cruxy arete boulder problem start. 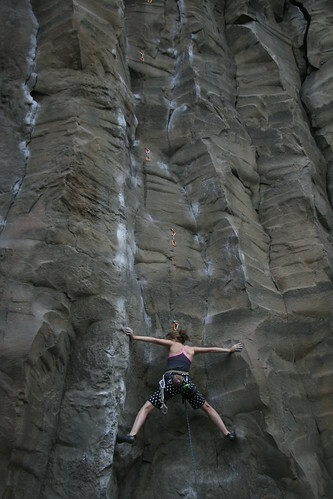 I was able to do all of the moves and after getting to the top I re-tried the bottom crux and got ready for the lead. The bolts are a bit oddly space but I was confident since I had yet to fall on the moves. On my lead attempt I must have been holding back a bit and my body was so tight that I could not reach a hold necessary for the tricky mantel. After a few tries I changed my sequence completly and managed to mantel using different feet and make it through the crux. I found my self on the half way no hands rest much more pumped then on TR and was happy to hold on through the crimpy finish trying not to pull the wrong way on a very low quality sidepull while clipping the anchors. Lizzy objecting to my morning enthusiasm at Mt Charleston. We did one more route the front of the Dinosaur wall and moved to a corridor on the inside with a plethora of newly bolted routes. 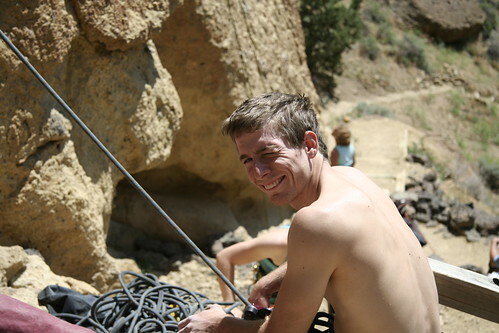 It was very nice to be in the shade and despite a previous to the area trip Josh had not climbed any of these routes. We were both excited to have our choice of routes and I chose an easy looking line with two bolts to a flaring hand crack. 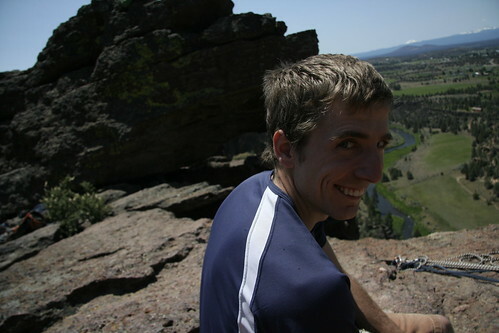 I grabbed an assortment of cams from Josh and led up the grainy chossy rock. After making my way into the crack we could tell how new these routes were as lichen and rock cascaded down onto Josh’s head. I was not excited with the gear and ended up placing 3 pieces from the stance as Josh laughed at me from below. I moved up, adjusted one of the cams, and started face climbing now that the crack had vanished. While there were no more bolts but the climbing was easy and I made it to the top. By the time Lizzy and Julie arrived in the corridor Josh was half way up the 50 ft “pitch” and we were both laughing uncontrollable. The rock was not the best and Josh now saw why I had been a bit sketched out and placed so many pieces. When Josh had tugged on 2 of my cams the lobes had just continued to open in the soft granite. Not the best sight. Josh and I finished the day with a few more TR’s and are excited to go back with some pads to try and headpoint one of the TR’s that had not been bolted. It looked like the climb could be protected with a couple of cams in a horizontal that would keep you off the deck for the crux follow by some unprotected crimping before a final crack and mantel top out. Hopefully I will have time to go back before it gets too hot. Lizzy doing a final bit of relaxing before we went climbing at Robbers Roost. 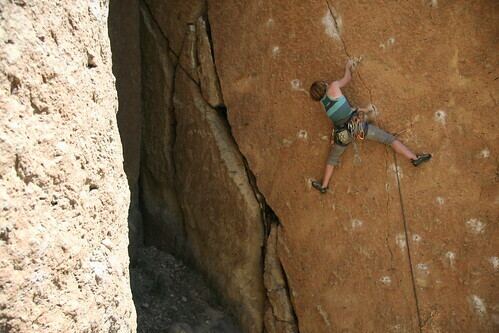 We are taking Lizzy’s final weekend before graduation to do a last minute sport climbing tune up at Mt Charleston. If all goes well Lizzy will send her project and I will send the slab route and perhaps the Rooster super extension. Lizzy is working on a blog with thoughts from Zion and I have a ton of photos to post in the next few weeks.